When I do scrapping (especially Curb Co. stuff) there is always the chance that someone will ask me what I'm doing. When I mention recycling/scrapping and finding stuff for Goodwill, there is always the chance they will ask to see some of the scraps I have to prove that I'm legit. So I always keep a few small pieces of insulated wire, bare bright, flexible conduit, etc. in the car with me. I know that many on this site will likely carry business cards with them- all the better. But I don't want to be caught empty handed, so to speak. Some might just carry tools, but that could mean you are a mechanic, carpenter or something else. Does anyone else carry stuff in the car like this? No, and I can't imagine how keeping a few small pieces of scrap in your vehicle is going to make a bit of difference if someone asks what you're doing. All of my pick ups are from businesses so I try to keep the truck as empty as possible. When somebody asks me what I'm doing I tell them. And then ask them if they're looking to get rid of what I'm looking for. In no circumstances can I imagine the utility of pre-filling the space I intend to go out and fill. I feel pretty much the same as everyone else here. I try to make sure my truck is as clean and empty as possible, with only hand tools on board for gas station cleaning - if I go stright to the scrapyard and can't remove wires and aluminum etc... I have several places that I have verified with the owner that it's OK to do that on their property. Thinking about this a little further, in my limited experience it does help "advertise" that you are a scrapper if you have stuff on your vehicle. Example - earlier this summer while driving away from a curbside pickup I drive by someone's home and a guy is out in his yard "hey - are you metal scrapping?" then he asks if I can take a bunch of stuff. I did. Recently my neighbor figured out I collect scrap metal and I just recycled over 1700lbs of ferrous, one 1060 lb. load and one 660 lb load, and another full load tonight planned all from his place of work perfectly in-between my house and the scrapyard, 2 miles away. Still, I don't see this as a reason to always keep items on the back of my truck, I try to keep that thing 100% empty when I am not collecting. One full heavy load @ one stop then maybe home first if there's a bunch of non-ferrous to strip off, then the scrapyard - that's the goal anyway. I'm going to jump on the bandwagon here and say that I also try to keep my vehicle relatively clean. I keep a large tote in the back with the seats laid down for more room, and to protect the carpeting. I also keep a 5-gallon bucket of ink cartridges so I can go by Office Depot once per month like clockwork and get my $10 recycling credit. Other than that, I keep a utility knife on the dash in plain view, and maybe a #2 Philips and flathead screwdriver in case I run across something that I only want to take pieces of. That's all I do. As far as advertising, I primarily do word of mouth. It has gotten me a fair bit of business, and I expect it will continue to do so. I have only been pulled over once, if you call walking a wheels-bin down the sidewalk in my neighborhood getting pulled over. Apparently a neighbor thought I was breaking and entering and stealing stuff. Once I told the cop what I was doing and showed him what I had, he was all cool. Didn't even check my ID. That's my 2 cents on the matter. Apparently a neighbor thought I was breaking and entering and stealing stuff. Once I told the cop what I was doing and showed him what I had, he was all cool. Didn't even check my ID. Not to de-rail the thread but a few weeks ago I was breaking down a mostly cast aluminum grill on my truck in what looked like a neighborhood with no one home cause I couldn't effectively strap it down - it kept wanting to fall out at speeds higher than 25. About 5 minutes into breaking it down, I see someone peeking out a window at me - I smiled waved at them the second time. So, I hurried up even faster. I got it broken down enough strapped the load back down and sure enough - as I was turing off the street a police officer turned on to the street. I didn't get stopped but I KNOW someone called me in, even though I was legally minding my own business on a public street legally parked away from anyone's house. Taking up space with last weeks picks is not a good business plan in my opinion! The items I carry take up less space than half a dozen eggs. Yet I have things that clearly the average person just doesn't carry in their car. That, to me, would be more convincing to a police officer or some other suspicious person than, say, a toolbox (which lots of people carry, even thieves). Another thing I carry in my glove compartment is a map of the city showing the different brush pickup zones and dates (from the city website). That, too, is something the average person would never have with them. My question is why the paranoia about the cops checking your car? For those that don't get it - from the Urban Dictionary: "ridin' dirty" - driving in an automobile while having at least a felony charge worth of illegal drugs and or unregistered firearms with you. Last edited by SKWrapper; 09-18-2018 at 02:24 PM. No paranoia at all. I never was a boy scout, but I always liked their motto "Always be prepared." Well it actually does mean that sometimes in my case but no problem. That's why I am here. Let me know if you would like me to explain some of the song lyrics from the rap artist "Fifty Cents" or maybe "Florida"
I believe my initial posting triggered a bit of a firestorm of responses. I don't think the original posting was well understood. I keep way less than 1 pound of scrap in my car to show others. That is hardly enough to make a dent in the load capacity of my vehicle, even if it is just an SUV. Vehicle title not signed-does that still work for scrapping? 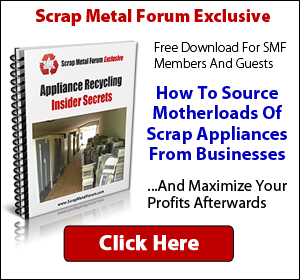 Interested in E scrapping where and how to start and getting material.